Bucks Survivor: Round Six ~ The Bucky Channel - The World of Sports from Wisconsin's Perspective. 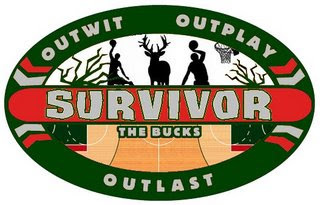 Last Week: Due to an eagerness to shake things up, and more likely an overall lack of creativity, the Bucks Survivor challenge saw a first last week. All eleven players that remained were placed on the chopping block, and three of them would be sent packing. Now, some of you thought it would be quite humorous to vote for Andrew Bogut and Brandon Jennings, two guys who obviously should not be heading out this early in the game. I'm not even mad you ate the whole wheel of cheese though, I'm just happy to see people vote. Results: Had this just been a single elimination contest, we'd be seeing a music video highlight package for Royal Ivey right now. Ivey lead the eliminations with 39% of the vote, Dan Gadzuric also fell out of the competition with 28% of the vote, and Kurt Thomas followed up with 15% of the vote. The next closest guy to being eliminated then was Bogut, and I can't imagine he's going to be the one kicked off this week, unless there's some kind of Vote for the Worst campaign going on here. This Week: Eight Bucks remain, and the normal voting pattern will resume this week as one Buck will be kicked off on Friday evening. Only one will be eliminated this week, and remember you want to vote for who you would like to see eliminated at the top right of the blog.